The wheel just BARELY fit in my lightbox. This blog post has been a long time coming. A long time. As long as I’ve been rebuilding my car since The Bonk. 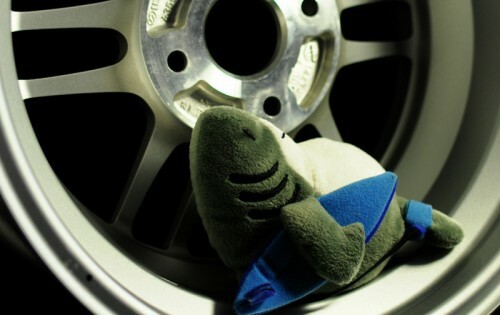 See, after I decided to rebuild Sharka, I started looking around for a new set of wheels. That was last November. I found these unique RP-F1s in June. I paid for them around the beginning of July. And now they are MINE. 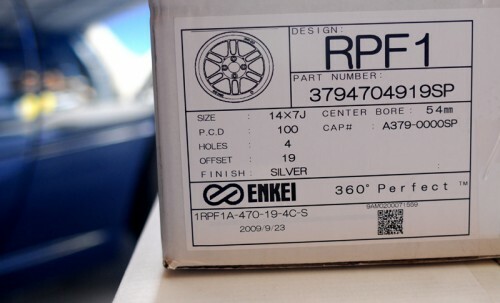 Back story: A guy named Mr Mazda329 on the ClubRoadster forum started a thread about these rare RP-F1s. 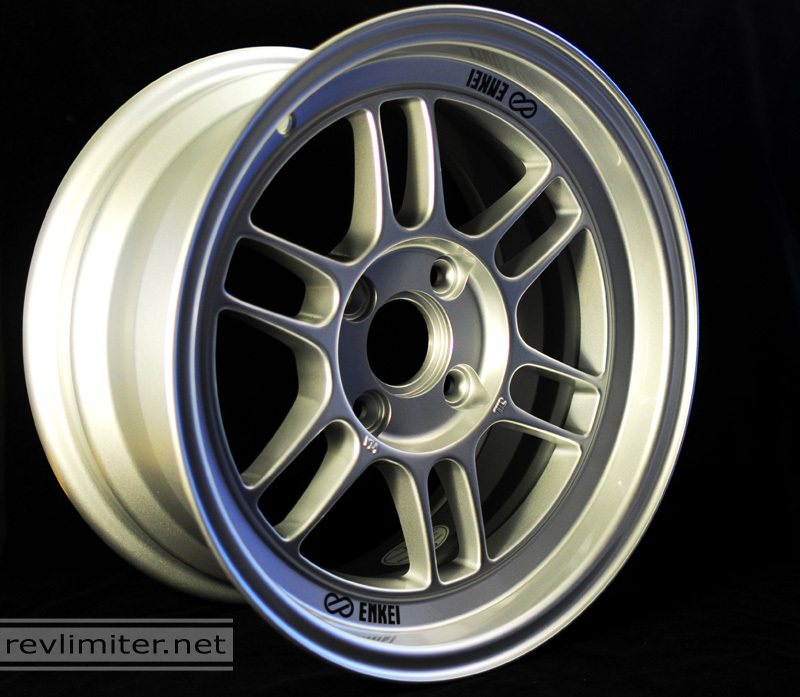 Other sizes are easy to come by, but 14x7s are only available in Japan though a company called istyling. The flat face and low offset are unique to the 14x7s, as is the 8.6 lb weight. This is a wheel bonnet! It's fabric. And the CR.net thread really took off. A couple dozen guys were all about it. At least ten guys were ready to put down cash on a group buy. 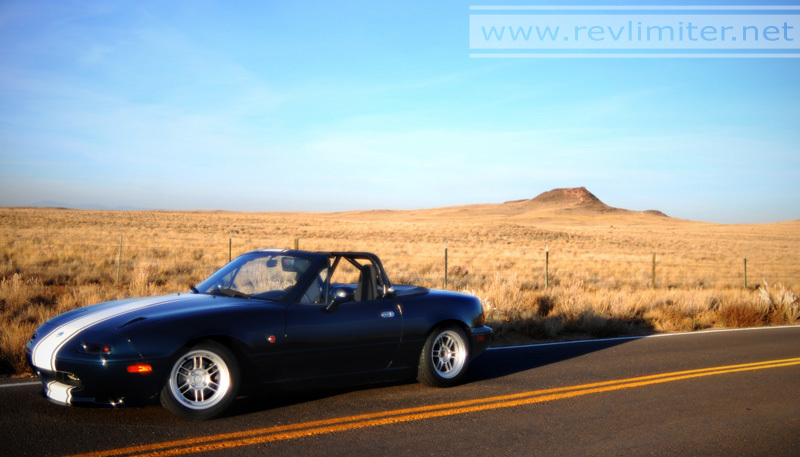 Several of the interested parties started shopping around the idea of these wheels to various Miata parts sites. Goodwin Racing said “sure!! !” and the dream became reality. The RP-F1 sees light for the first time. Several things happened behind the scenes and Enkei decided to produce this wheel in both +28mm offset and the original +19.5mm offset. Long story short, I secured a set of FIVE in the +19, in silver, just as I’d hoped for. I figured I’d buy a spare just in case I bend one. 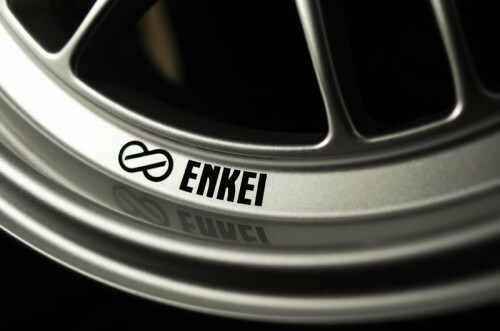 Several long months were spent waiting for Enkei Japan to machine up a set of wheels for Sharka. Five wheels. Which lucky four will get mounted? The months finally passed and the wheels arrived in my garage. Prior to this, I secured tires (Toyo T1-Rs), lug nuts that wouldn’t destroy the wheel finish, and a fender roller to take care of any fender lip problems. The last bit of back story… it seems that Enkei is now planning to sell these mass market-style. No waiting for their machine shop. No group buys required. Just browse over to TireRack and place an order. Note the part number on the label? They also list the 14×7 RP-F1 in their 2010 literature. So, maybe these wheels aren’t as rare as I’d hoped, but that’s not getting me down. I’ve got my set and I’m loving life. 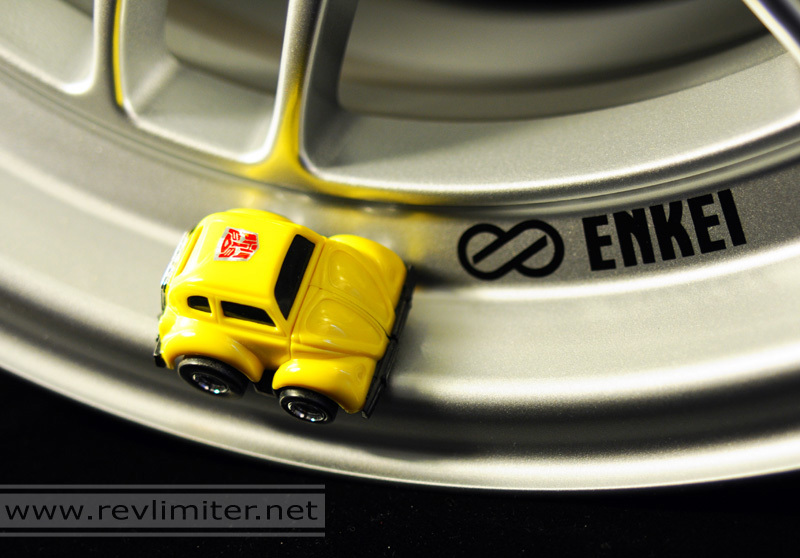 The logo and the wheel finish. One G1 Bumblebee worth of lip. 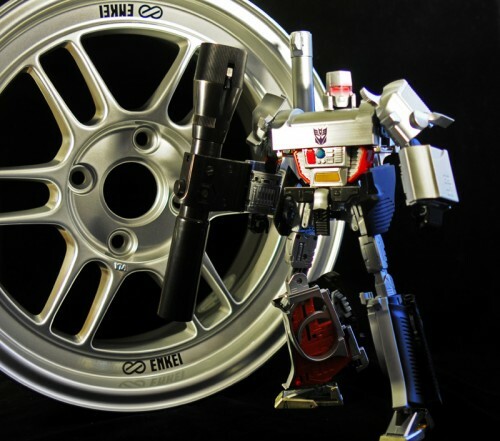 Megatron poses with the spare wheel. 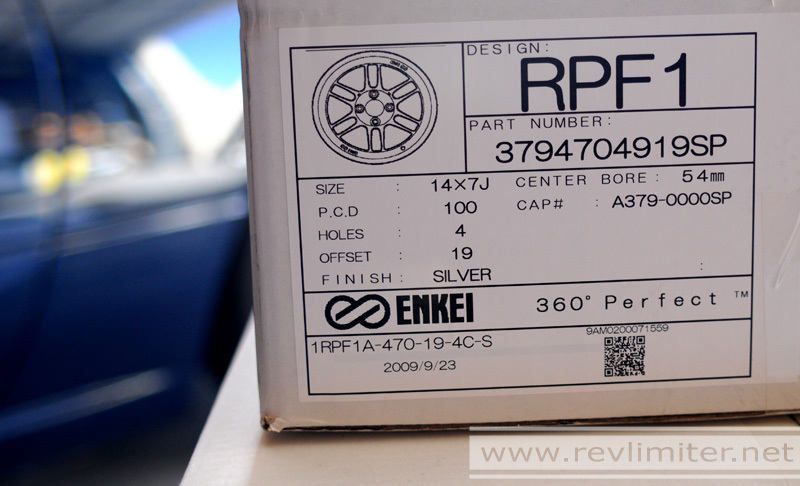 Enkei even included these spiffy, blue valve stems. Now THAT is a happy shark. Fresh wheels required a trip to the carwash. Yes, I like the new wheels. They're not going back. Offset difference between my old +38 Rotas and the new +19 RP-F1s. My Vivitar lens gives a great vintage look to photos. The wide angle version of a shot above. 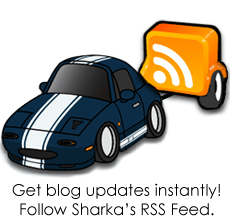 And with this post, I’m calling the Sharka Restoration finished. I won’t add any more blog posts to that category. I’ve still got stuff to do and many, many ideas, but I feel that I’ve reached a landmark. I feel done with the rebuild. I feel that Sharka is complete again. It’s been a LONG year. But today, I feel free. Keep those tops down, my friends. Wha? from Japan, and they dont transform? 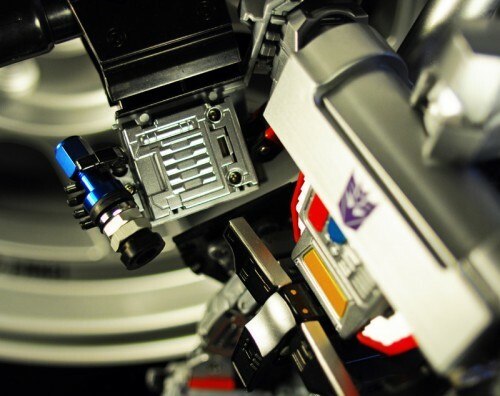 Oh, they transform. They transform Sharka into AWESOME Sharka!!!!! What size tire are you running? The lenses on your turn-signal intakes look different from the ones I’ve seen at Goodwin Racing. Where did you get them? 1: 195/55/14s. I have the Toyo T1-Rs mounted at the moment. 2: Here ya go! https://revlimiter.net/blog/2009/10/turn-signal-intakes/ I spent a lot of time on those TSIs. Thanks for the reply. 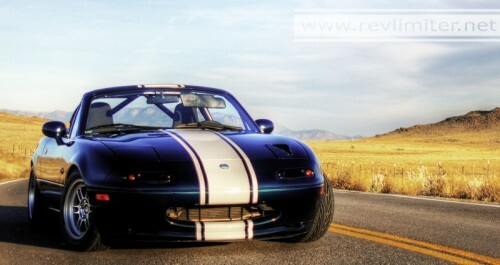 I might put some these wheels and similar tires on my NA. So what are your plans for when these tires wear out, since 195/55-14s are no longer available? 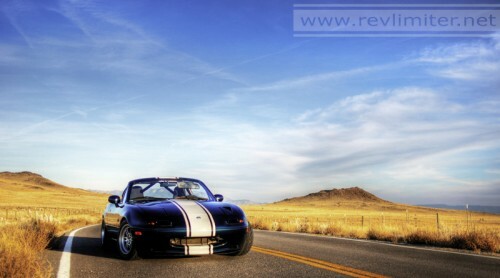 I really like the look and lightness of those 14×7 RPF1s, but the tire selection seems rather lacking. There’s at least a handful of decent 14″ tires available. Dunlop Star Specs for one. I’ve got those on my NB. They blow the Toyos out of the water. Totally different league. The Dunlops remind me of the BFG race tires of 11 years ago. They’re really good. And I’m sure others will come along as well. So you had to do a fender roll? 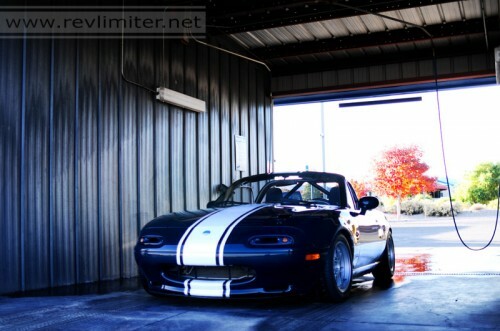 I just order a set of 14×7 et19 was going with Bridgestone 185/60-14 will I need to do a fender roll? Still looking at suspension as part of my 2011 plan. 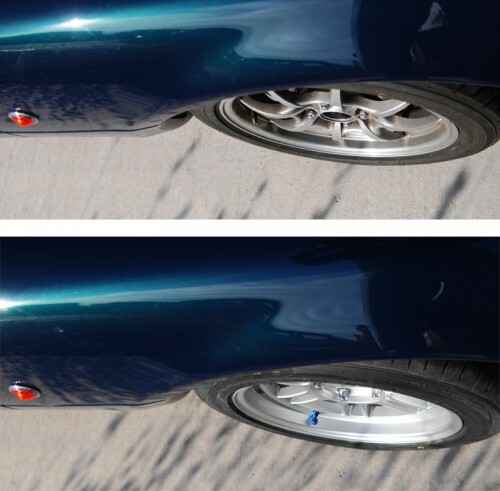 How did you or what did you use to roll the fenders? I’ve done two cars worth of fenders now. The first one, I used a small sledge hammer (1 lb I think) and my hand. Jack up the car, 4 jack stands, all wheels off. Sit INSIDE a fender, wear hearing protection, and slowly bang the lip into the fender. It helps to start the bend with the classic baseball bat approach when the car was still on the ground. Place one hand outside the fender bang away at the fender lip with the hammer. This sounds crazy, but it works great. The 2nd car, I used a professional fender rolling tool. A local guy kindly let me borrow his. I heated up the paint and lip with a heat gun (it was around November when I did this) and went slowly. I had much better results with the hammer. I had some paint cracking with the rolling tool. Not during the rolling, but after when the paint/metal was cooling. I guess I heated too quickly and cooled too quickly. It wasn’t much cracking and I was able to fix it with touch up paint, but I was still disappointed. The key is to just go slow and take your time. Thanks I will be trying this in th espring the car is in storage for the winter. Got my wheels. 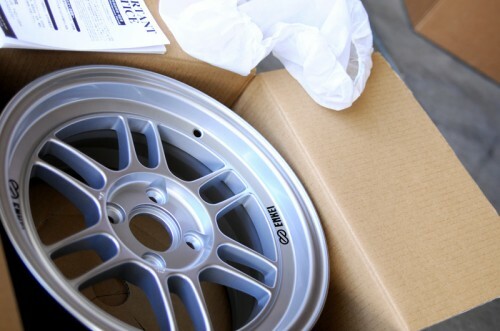 In your opinion will 185/60-14 be fine with these wheels or should I go to a 195/60-14? I think either size would be fine. Either would work well with N/A power levels. But if you get up into turbo power levels, neither tire will be too great. I’d kinda like a 225, myself, but I’d have to go up to a 15×8 for that. Most of the Japanese cars with these wheels run 185/60s. 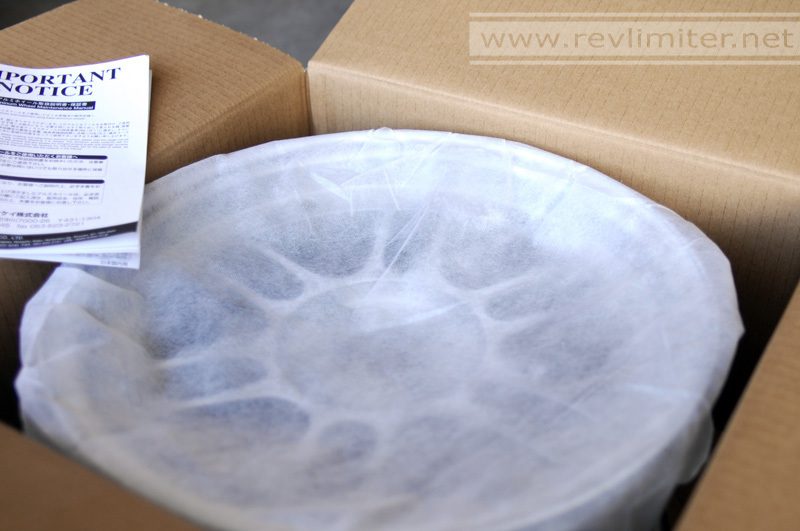 Makes for a very slight stretch and a great looking sidewall. Thanks I think will go with 185/60-14, no turbo. Did change my mind on the KG work instrument panel and got into the group buy on Club Roadster. Sweet! You’ll love that cluster. Yet another question: What ride height are you running? 4.4″F, 4.5″R. This is the pinch weld to flat concrete measurement. I admit, I’ve considered getting a 2nd set of these just to hold a set of snow tires so that I could drive Sharka more in the cold months. Hmmm. How come I didn’t get a notification of your reply? 🙁 I just happened to come back here for some info and saw your reply. Can I ask you something elseâ€¦? You’re running 195 and you had to roll fenders. I see Goodwin talks about putting 205 or 225’s on some cars with 14’s. So, I suppose to run tires that wide, you’d better better off with the 28mm offset wheels rather than the 19’s right? So you can have more space for the wider tires. Makes sense? I wonder what the difference in looks are between the 19mm / 195 combo and the 28mm/205 combo. My server became extremely insane about email lately. Rather unhappy with it actually. It barely emails ME. It completely lost the ability to send comment emails to folks on different domains. 205 or 225 will definitely need some good rolling. 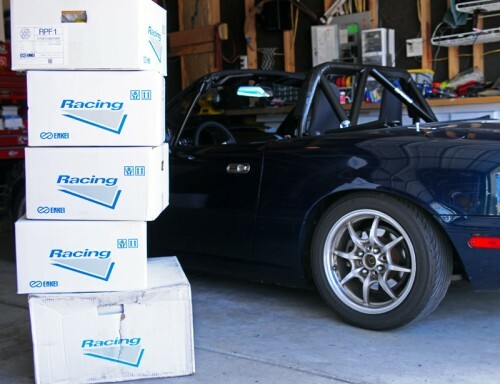 I used to run 15×7+35 wheels for autocross. With 225 rubber, I had crazy problems with tire rubbing. Lots of metal massaging was needed. Of course, the V710s I was using were known to be rather wide. However, it’s easier to bend fenders than to deal with rubbing on your shocks. I also had that problem with those +35 wheels. So… 19mm might indeed be a better choice. I’m unsure. Hey, nice new wheels, though i realize you posted this in 2009 so i guess they’re not that “new”. I’m actually really digging the ones the RPF1s replaced – what were they?